Scot Postle has been fascinated with sawmills from the time he was a small boy. Growing up on a beef cattle farm they always needed lumber for fences and barns. His dad and grandpa always wanted a sawmill but their only choice was to take the logs to a local mill. Scot was always the one to volunteer to drive the tractor with wagon loads of logs or lumber – any excuse to see the sawmill in action. In school he took six years of fine wood working, throughout which the family also pulled together to help each other with home construction projects. It was all these activities that continued to expand his interest in wood products. Back in 1996, Scot and his wife purchased her family’s 150 acre farm which contained 60 acres of mixed hardwood. Shortly after buying the farm they purchased a used Foley Belsaw to convert storm damaged trees into lumber for use on the farm. As soon as the family and local farmers learned of his sawmill he instantly had more business than he ever intended to take. He learned a lot about sawing on the old Belsaw, but was limited by the mill’s incapacity for large logs and lack of portability. Knowing that he could now convert trees into valuable lumber at a profit he started looking at options for a mill with a larger capacity, higher production, portability and good accuracy. Several customers were buying his lumber because it wasn’t wavy like what they purchased from the band saw mills. It was at the Paul Bunyan Show in Ohio that he met a guy by the name of Chris Browne who was showing off a Peterson Portable Sawmill – and Scot was instantly hooked. The Peterson had the capacity, production, accuracy and portability that Scot was looking for. In hindsight, his only regret is that he waited two and a half years after that show before ordering his Peterson. Eventually though Scot decided on an 8in. 27 horsepower All Terrain Sawmill. The entry level mill is ideal for people taking the mill to the log, with the mill easily fitting onto a trailer or the back of a pick-up truck. Scot can be set up and milling in less than half an hour, cutting logs up to 20 feet long, and up to 5 feet in diameter. The mill also allows Scot to perform a ‘double cut’ where both sides of the blade are used in two consecutive cuts. “I use the double cutting much more than I ever expected too. I sure am glad I picked Peterson every time I double cut, it’s just so easy.” One of Scot’s customers wanted several 2in. x 14in. boards from logs that were too large to cut on most of the local mills. Another customer needed 8in.-12in. diameter logs cut right through the centre for a log cabin he was building. exchange Points for sawmill parts and accessories. 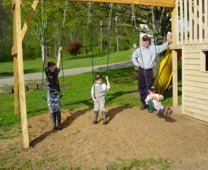 One of Scot’s more enjoyable projects though was the designing, sawing and constructing of a play set after a casual comment from his wife that it would be nice to have a swingset for their three kids. With help from his family, Scot spent three evenings milling on his Peterson to get the lumber he needed. They then had another four weekends constructing and assembling the entire arrangement. For the design, Scot’s two sons, aged 8 and 5, and daughter, 3, were asked what they liked and didn’t like about the expensive play sets at the home improvement stores – then they made one bigger and better themselves. Now, Scot and his family have one of the coolest play sets in town. Measuring 30′ long and 12′ high, it includes three swings, two slides, a ramp up to the first slide, a sand/sawdust box under the first slide, a swinging bridge over to the second slide, and a second level ‘lookout tower’ play area. The lower part of the centre section is a 6′ x 8′ play house with a small front porch. The play house also has a stairway up to the lookout tower and second slide. 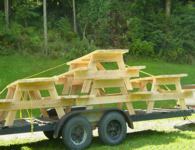 Scot now has dreams of going one better, building a timber frame addition for their own house, using their own lumber for the frame, floor, cabinets and trim. And his advice to those looking at buying a sawmill?